A suitable and excellent anti-aging night cream is what we need to nourish our skin after a long day. The night is the best time to repair damage inflicted on our skin during the day and prepare it to fight the stresses it will be confronted with again the following day. 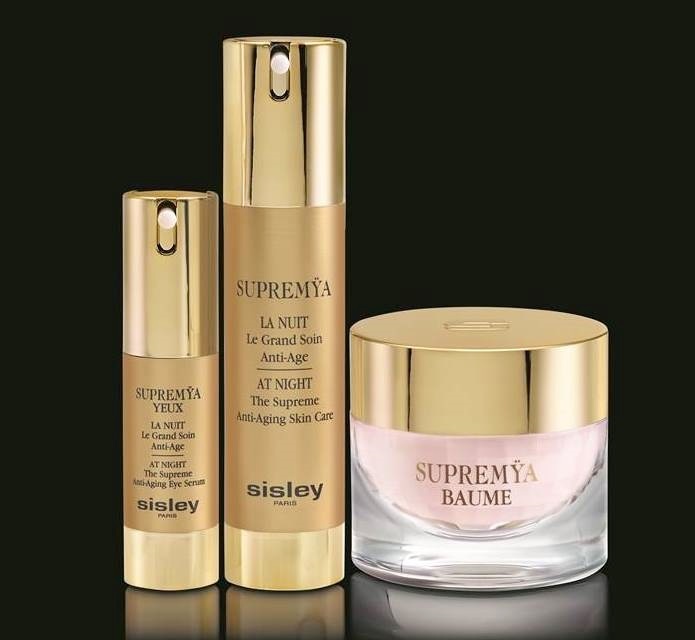 Here are the sisley SUPREMŸA Baume At Night cream for the face and sisley Phytobuste + décolleté for the body. As we aged, I am sure some of you might have experience dryness, tightness, tingling and redness on your skin. Dry and very dry skin types suffer from dehydration and as a result, these skin types are more prone to pre-matured aging. sisley SUPREMŸA Baume at Night Cream comes in a golden shinning box and an elegant shimmering glass jar with gold cap. It looks luxury from the outside and the cream texture is superbly exquisite and opulent feel. The sisley SUPREMŸA Baume at Night Cream color is light beige and the texture is creamy and rich. You only need to apply a small amount for the whole face. There is no fragrance in the cream, to me this night cream smells like mild herbal and botanical. The sisley SUPREMŸA Baume at Night Cream color is light beige. The texture is creamy, rich and firm. You only need to apply a small amount on the whole face every night. The price of the cream might give you a shock however you will be delighted with results and quality of this luxury cream. The jar of 50ml cream might last for more than 3 months. I only use a small scope at night after my serum. I have dry skin so immediately I can feel that my skin is very moisturize, relaxed and comfortable. The next morning when I wake up I can feel that my skin is not tight or blotchy. SUPREMŸA Baume At Night is enriched with restructuring and soothing oils and butters to protect, nourish and intensely moisturize these skin types. Its rich formula works deep down to restore lipids, as well as helping improve the skin’s barrier function to limit moisture loss, which is higher during the night. What’s more, the SUPREMŸA Baume formula contains 8 active ingredients that help moisturize and nourish the skin: glycerin of vegetable origin, rice phytoceramides, padina pavonica extract, Pro-Vitamin B5, Phytosqualane, Shea butter, Sunflower oil and Plum oil. Plus its enriched with hazelnut oil, kokum butter and macadamia oil. SUPREMŸA, a powerful as a serum, its soft and sensory texture enables the skin to gradually charge itself with active ingredients during application. SUPREMŸA BAUME, a rich in nourishing active ingredients, its rich and enveloping balm texture meets the specific needs of drier skin lacking comfort. SUPREMŸA YEUX, a silky serum texture that targets problems specific to the eye area: dark circles, puffiness, sagging eyelids and crow’s feet. Please take note that this cream is suitable for aging and dehydrated skin. For those with combination or oily skin I think it will be too rich for you. 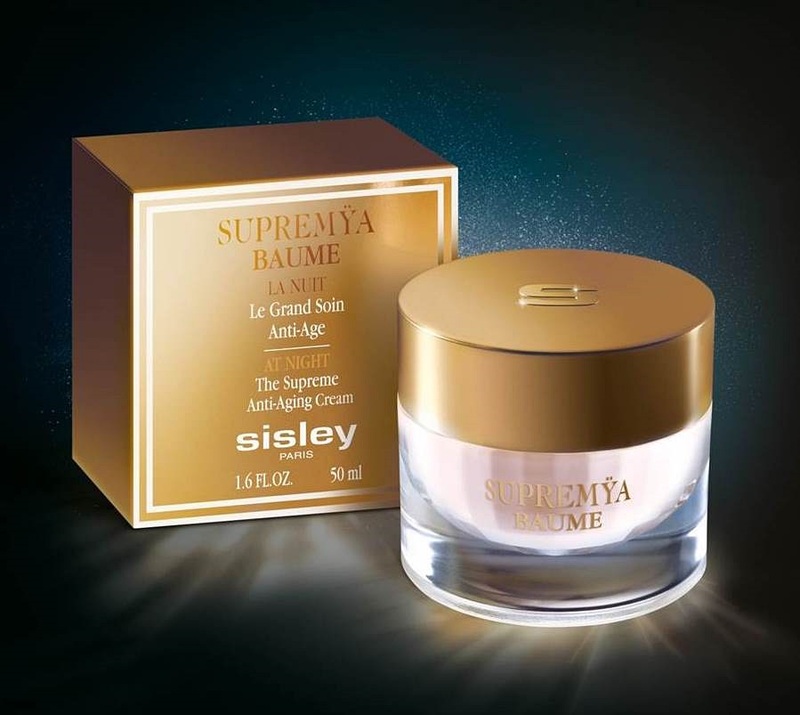 Overall sisley Supremya Baume At Night Cream is extremely moisturizing, nourishing and repairing for the matured skin. It helps to repair the past and rejuvenates the skin. It gives you a firmer, denser, smoother, more radiant and regenerated gradually. Hey don’t forget to pamper our body after taking care of the face ya. Here is the sisley Phytobuste + décolleté, the intensive firming bust and décolleté compound for the special attention and specific skin care treatments. Well, sad to admit that as we aged our skin sagged, we lost the elasticity, density, firmness and volume due to diets, sun exposure, pregnancies, menopause, poor posture, the skin’s natural ageing process. sisley Phytobuste + décolleté comes in an off-white glass bottle with pump. The texture is like thick serum with fresh botanical scent. When apply on the skin it gives a mild cooling and comfort sensation. Its smooth and easy to glide on allowing the chest to be delicately massaged and is rapidly absorbed, making it possible to dress quickly afterwards. The formula, naturally scented by a combination of essential oils of Marjoram, Litsea cubeba and Juniper with a fresh and tonic accord, gives an invigorating and toned sensation upon application. It is not only for the bust and décolleté, I can also apply it on other parts of the body which required firming and attention. For your information, I applied on my knees as well. Do you noticed that the skin around our knees areas began to sag and its not so pleasant when we wear above the knee length to take photos. After apply it for about 4 weeks, not only I see the firming effect but also more moisturized and the dark skin tone around that area began to lighten. The best is to apply 2 times a day, morning and night before bed time consistently for 2 months to see the results. Upon application, immediately I can feel the the skin of the décolleté and bust or targeted areas is smoothed and moisturized. After 4 weeks, the bust’s is more toned and after 8 weeks, the skin began to firm. By far this is the most feminine of sisley skin care treatments, combining toning and firming active ingredients, the formula smooths the décolleté and improves the tone, elasticity and firmness of the skin as well as the chest’s support. Your photos are beautiful. Thanks for the review. Gonna check this out. nice writeup and review of the product kelly! I love Sisley products but they are so expensive ! Nice photo of you.. The products look very rich in texture and classy. If they really are effective, people won't mind paying. Such a lovely product.. Wish I could try it out, too! the cream looks really really rich, i wonder how is it oily or not when put on the face.